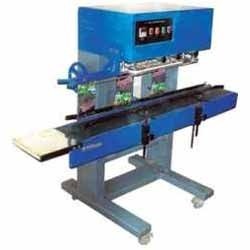 Our company specializes in the manufacturing, supplying and exporting of Automatic Band Sealer Machines which give best performance with out creating any sort of trouble. The pouches move horizontally due to their excellent filling capacity are used to fill tea bags, snacks etc. In addition to this, these are developed by the leading industry experts employing the modern tools of fabrication. These are available in 3 models. Automatic Band Sealer Machines keep feeding the filled pouches from one side of the machine. The Roller Bands will heat seal your pouch, move them forward & release them at the other end. No operator handling is required, thus making the sealing process very easy & fast. Optionally Embossing or printing of Exp. Dt., etc. will also take place simultaneously. We provide Automatic Band Sealer Machines which keep feeding the filled pouches from one side of the machine. The Roller Bands will heat seal your pouch, move them forward & release them at the other end. No operator handling is required, thus making the sealing process very easy & fast. Optionally Embossing or printing of Exp. Dt., etc. will also take place simultaneously. 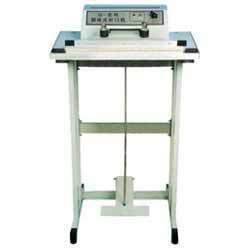 We provide our clients Automatic Band Sealer Machines. These machines keep feeding the filled pouches from one side of the machine. The Roller Bands will heat seal your pouch, move them forward & release them at the other end. No operator handling is required, thus making the sealing process very easy & fast. Optionally Embossing or printing of Exp. Dt., etc. will also take place simultaneously. Heavy Duty Bag Sealing Machine for sealing large bags or filled pouches upto 15 Kgs each of tea, snacks, etc. of all materials up to 30” height. It has a Variable speed conveyor for carrying the filled pouches in the Roller Bands that heat seal the pouch, move them forward & release them at the other end. No operator handling is required, thus making the sealing process very easy & fast. Embossing of Exp. Dt., etc. also takes place simultaneously if required. 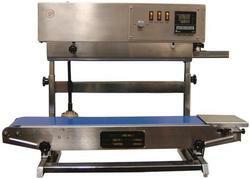 This sealer is suitable for large bags of Tea / Coffee, snacks, powders, pharmaceuticals, chemicals, seeds, spices, etc. Pneumatic Bag Sealers also known as Pneumatic Bag Sealing Machine is widely used in chemical industry, foodstuff, feedstuff industries to seal various plastic film bags and compound bag whose sealing length is less than 600mm and weight is less than 50kg. The machine can also run together with conveyor or production line. Adopts compressed air as power, characterized by adjustable sealing pressure and stable quality. 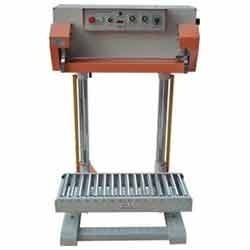 Pedal Sealing Machine with heavy duty Aluminum body & sturdy design for sealing all types of bags or filled pouches of tea, snacks, etc. keeping hands free & avoids spills during sealing process. Auto heat cut-off feature saves electricity & protects operator from electric shock. Adjustable timer with seal completion buzzer & light indicator ensures even seal for variety of pouch materials. 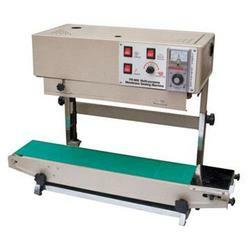 This sealer is suitable for Tea / Coffee pouches, snacks, powders, pharmaceuticals, chemicals, seeds, spices, etc. We provide our clients Gas Flushing sealing Machine. These machines keep feeding the filled pouches from one side of the machine. The Roller Bands will heat seal your pouch, move them forward & release them at the other end. No operator handling is required, thus making the sealing process very easy & fast. Optionally Embossing or printing of Exp. Dt., etc. will also take place simultaneously. Pouch Sealing Machines is used for packaging of pouches in several industries. 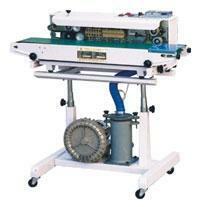 Looking for Band Sealing Machines ?